I’m so thankful for the Thoughts & Prayers stamp set! I’ve owned it for years, and it is one of my ‘go to’ sets when making sympathy cards. Last month, I created several a number of sympathy cards for a friend, so that she has them on hand for when the need arises. She works with an very elderly population, so unfortunately it’s more often that she would prefer. The muted colours, simplicity and tree image make this card suitable for giving to either a male or female recipient. Stamp the tree image from Thoughts & Prayers in Tranquil Tide ink, slightly left of centre on the Whisper White cardstock panel. To the right, stamp the sentiment from the retired Wetlands stamp set, also in Tranquil Tide. You can use the sentiment from Thoughts & Prayers; I just wanted a bit of script on the front. Cut a panel of Tranquil Tide cardstock 1/4″ larger than the white panel. Next, cut a panel from the Delightful Daisy Designer Series Paper – use the Tranquil Tide polka dots pattern. Attach the panel of Tranquil Tide cardstock in the centre of the DSP with Stampin’ Dimensionals. Now, attach a length 1/2″ Finely Woven Ribbon in Tranquil Tide across the middle of the cardstock, and attach it in the back of the DSP. Use Tear & Tape to hold it in place. You can now attach the stamped panel on top, with Dimensionals. Attach the entire front panel to a Tranquil Tide card base. To finish off the front, I added 3 Pearl Basic Jewels to the top right corner of the stamped panel. 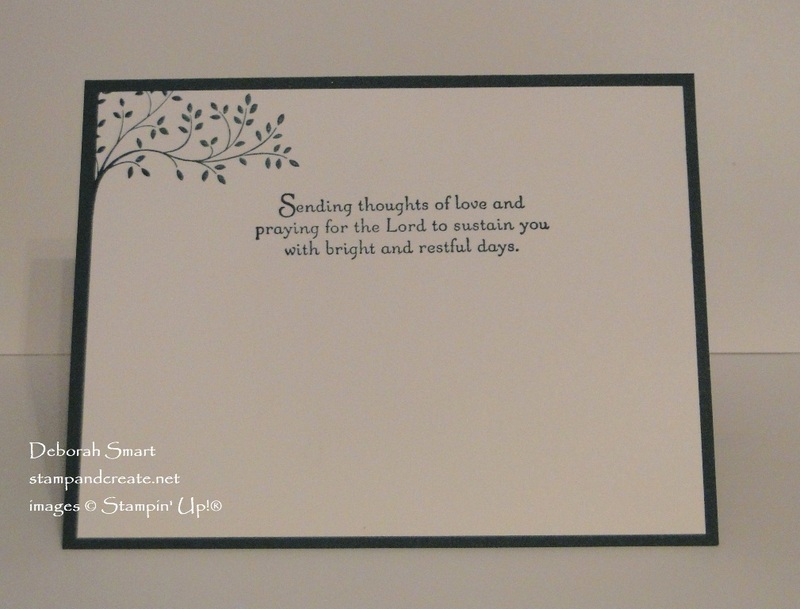 The sentiment is stamped onto a panel of Whisper White cardstock, in Tranquil Tide ink. I also stamped a portion of the tree image, also from the Thoughts & Prayers stamp set. While I used the Thoughts & Prayers stamp set for a sympathy card here, it can also be used for ‘thinking of you’, or ‘get well’ cards; it has the appropriate sentiments for those as well. Order from my online store by either clicking the product images below, or on my signature. My online store is open 24/7, so you can shop whenever it’s convenient for you! Previous Previous post: FREE SHIPPING TODAY ONLY!